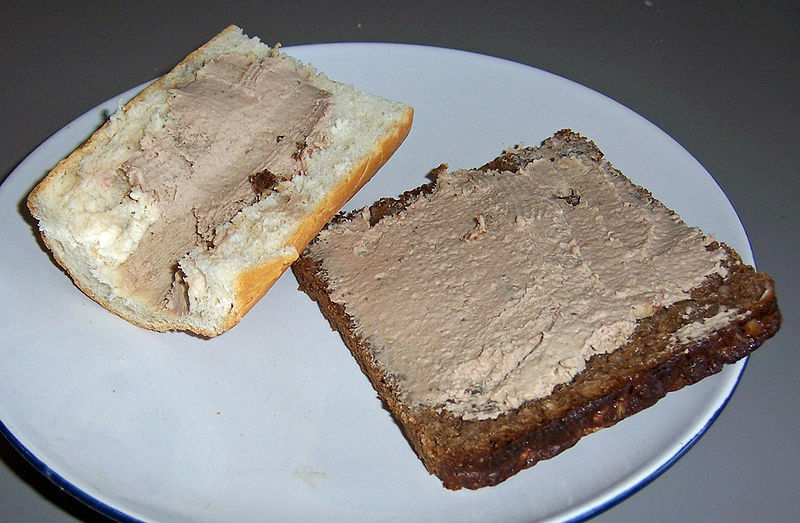 Leverpostej is a "pâté" made of pork liver and lard, which is a popular spread in northern Europe. Leverpostej is very similar to the German Braunschweiger. In Denmark the liver is formed into a paste to which herbs, salt, pepper and other desired seasoning are added. It is then put into a loaf pan and baked in an oven. Left: Baguette and rugbrød with leverpostej. The leverpostej is sliced or spread on Danish dark rye bread (rugbrød) and eaten as an open faced sandwich. It might also be topped with any of a variety of pickled items, such as beets, onions, or cucumbers. It is also traditional to place a slice of corned beef (salt kød) on top of the leverpostejmad. A more extravagant variation is the prepared Danish open face sandwich (smørrebrød) called Dyrlægens natmad (lit. "Veterinarian's midnight snack") — on a piece of dark rye bread, a layer of leverpostej is topped with a slice of corned beef (salt kød) and a slice of meat aspic (sky). This is all decorated with raw onion rings and cress. Leverpostej is also served warm on rye bread, or sometimes on warm baguettes called Franskbrød. Traditional toppings include bacon slices and sautéed mushrooms.